It's crazy to think that Christmas has already come and gone for the 2018 year. All eyes are now on New Year's Eve and New Year's Day; we are almost to 2019 folks! For the last few days of 2018, we will experience some pretty dreary conditions unfortunately. Maybe Mother Nature is sad to see 2018 go? Regardless, clouds continue to spread across the Mid-South today with these clouds expected to hang around over the next few days. By Friday, we will get a brief break from the dreariness before more clouds arrive Saturday into Sunday. 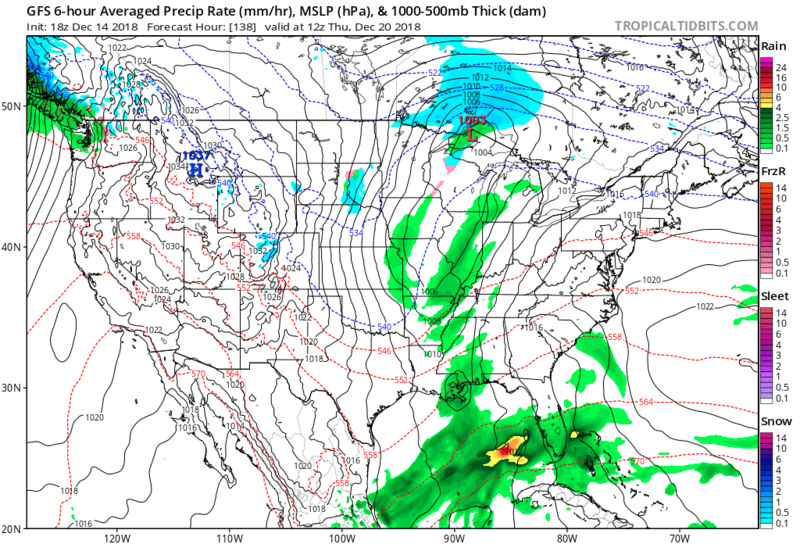 New Year's Day looks pretty pleasant, but we may have to deal with more rain on New Year's Eve first. 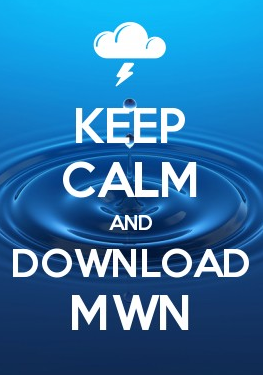 But don't worry - we've got you covered! While we had a few scattered showers move through the metro area this morning, the majority of us have stayed dry so far. Cloudy skies will continue through the remainder of the day with highs climbing to near 59. We will begin to see a pattern shift late this evening as winds begin to increase as well as our rain chances. As for winds, all of the Memphis area is included in a Wind Advisory from midnight tonight through 6 PM tomorrow. What does this mean? This means that wind is expected to be upwards of 20+ mph with gusts into 30s likely. If you have any loose outdoor decorations, I would make sure they are secured to the ground before you head to bed tonight. As for our rain chances, expect for scattered showers to begin developing after 10 PM, with an increasing chance through the rest of the overnight hours. Tomorrow looks to be characterized by windy and wet conditions. Highs will reach an unseasonably warm 65 degrees by the afternoon. Expect rain to hang around through the majority of the day with some late morning/early afternoon thunderstorms being possible. While we could see a few thunderstorms, widespread severe weather is not expected. Once again, it will be pretty windy tomorrow. Southerly winds will continue around 25 mph with gusts upwards of 35 mph, particularly in the morning. Winds should begin to calm down by the evening hours and showers should become more scattered in the evening as well. Temps will fall to 47 overnight. After some dreary conditions, we will get a nice break from the wind and rain on Friday. Mostly sunny conditions are expected throughout the day with highs near 58. Overall, it will be a very nice and pleasant day. Periods of cloudiness and periods of brief sunshine will dominate this upcoming weekend with highs much cooler - remaining in the upper 40s both days. We could see some light rain both days as well, although the daytime should remain dry. If we do see some rain, it will primarily develop in the evening to overnight hours both days. Overnight, temps will dip down into the mid 30s, but no worries - we aren't expecting any winter shenanigans at this time. Lots of New Year's festivities will be taking place both Monday and Tuesday, as well as fans coming into town for the Liberty Bowl. For those of you already thinking of what to pack/what to wear for New Year's Eve activities, it looks like it could be wet for a good portion of the daytime hours. Highs will reach near 50. A layered approach with the poncho on top will be best at the football game! Luckily for those venturing out in the evening, showers should *hopefully* clear out into the evening hours. 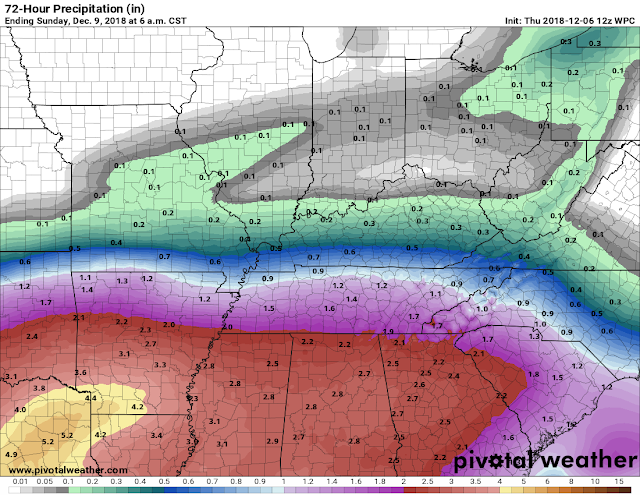 While we can't make any promises this far out, models do currently indicate that things should dry out for the Mid-South by midnight. Temps will likely be in the 30s by midnight, so you'll definitely want to bundle up if you are planning on heading downtown for New Year's Eve festivities. Keep those fingers crossed for dry weather at midnight folks! On Tuesday, clouds will clear throughout the day leaving behind dry conditions and highs in the mid 40s. For the first few days of 2019, temps will remain a few degrees below average. Can you believe it is already almost 2019? Christmas Day weather in Memphis – What does history tell us? Undoubtedly one of the most common questions meteorologists get during the holiday season: “Any chance of a White Christmas this year?” That is no less true here in the Mid-South where a significant snowfall at any point in the winter season can be a unique (and disruptive!) event. Fortunately, thanks to a lengthy modern weather record available for Memphis that dates back to 1875, we have a pretty good idea just how likely a White Christmas is, at least statistically speaking. 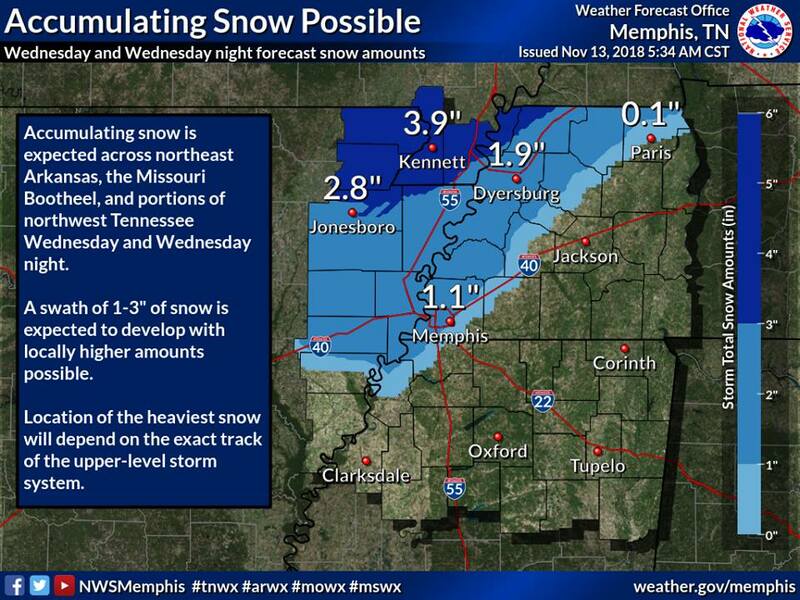 As you'll see below, and as you were already expecting, the odds are not in snow lovers’ favor! Before jumping ahead to our chances of a White Christmas, here are some temperature statistics for Christmas Day in Memphis, thanks to data compiled by NWS Memphis and the National Climatic Data Center. The coldest Christmas Day in 142 years of records was in 1983 as a major Arctic air outbreak was gripping much of the nation. The high in Memphis that day was a mere 16 degrees after a bone-chilling morning low of 0! No snow that day, though it was plenty cold enough to support it! 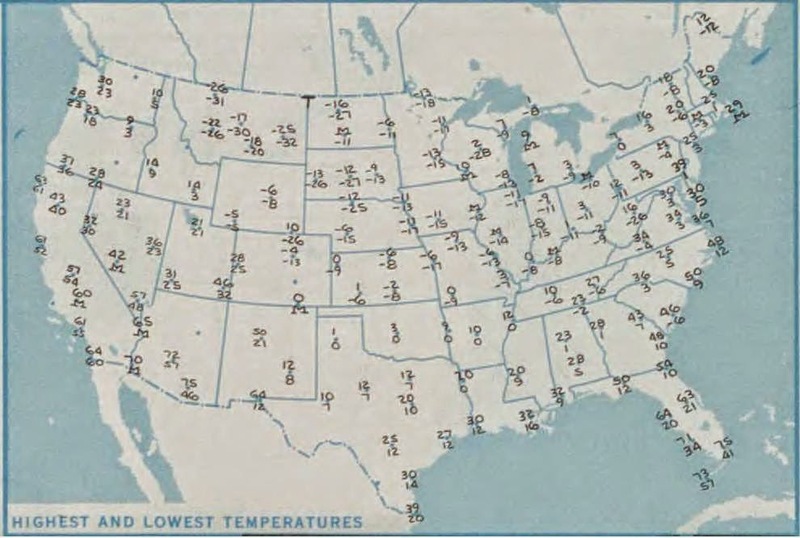 High/low temperature map Christmas morning 1983. Brutal cold dominated the nation along/east of the Rockies except south Florida. 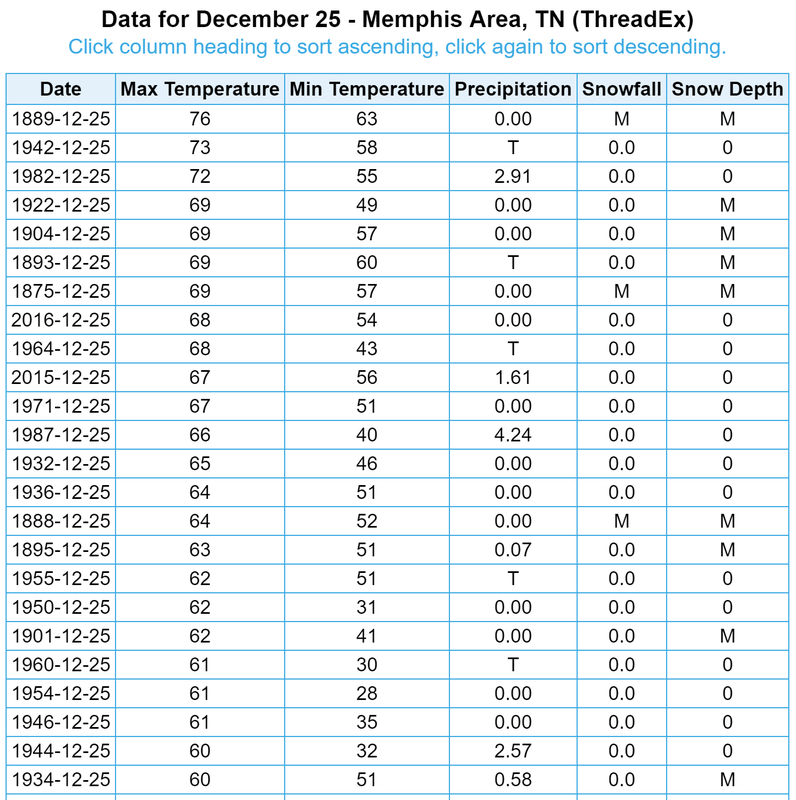 On the flip-side, the warmest Christmas Day in the records was in 1889 where the temperature reached a balmy 76 degrees after a mild low of just 63, a month that ended up by far the warmest December in Memphis history. When you average it out over 140+ years of records, a seasonable Christmas Day isn't too bad - with a high temperature of 48 degrees and a low near 33 degrees and skies that average partly cloudy to partly sunny at worst. In terms of any type of precipitation, measurable amounts (0.01” or more) have fallen on Christmas Day 37 times. 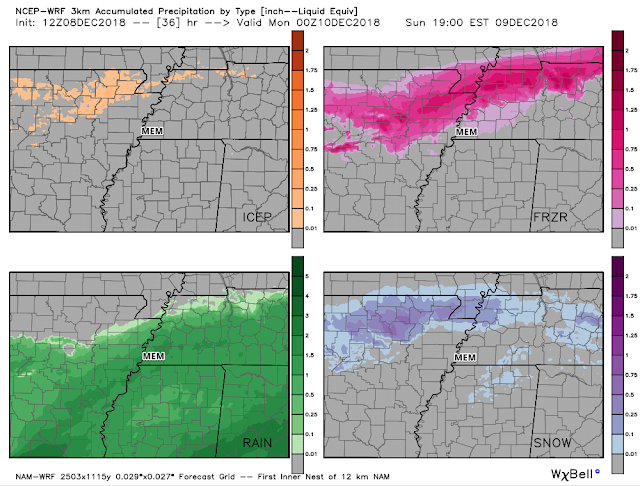 The vast majority of those years featured just liquid rainfall in mainly light amounts, but one major soaker occurred in 1987 when 4.24” of rainfall was reported at Memphis, following an equally soggy Christmas Eve. Some Mid-South residents spent that Christmas dealing with flooding, the hardest hit of those in West Memphis, AR where cleanup was still underway after a destructive F3 tornado just 11 days earlier on December 14 (link). There have been nine times that more than an inch of rain has fallen on Christmas Day, most recently in 2015 (1.61"). Sleet or freezing rain has been reported on Christmas Day a handful of those times, but just trace or light amounts. Now the statistic you most want to know. Just how likely (or unlikely!) is a White Christmas in Memphis? The answer definitely lies on the “unlikely” side of the equation; in fact it’s more appropriate to label a White Christmas in Memphis as exceptionally rare. 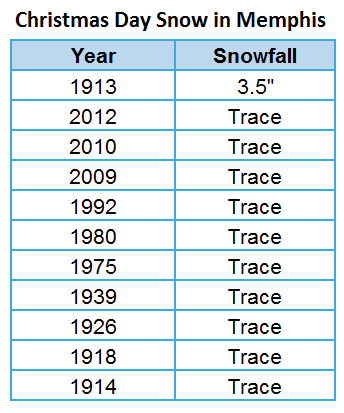 Only once in over 140 years of records has measurable snowfall occurred. That was in 1913 when 3.5” of the white stuff made for the sole exception to the rule we still consider today. However, there have been several other years where snowflakes have been seen in the Memphis skies on Christmas Day but with no accumulation. 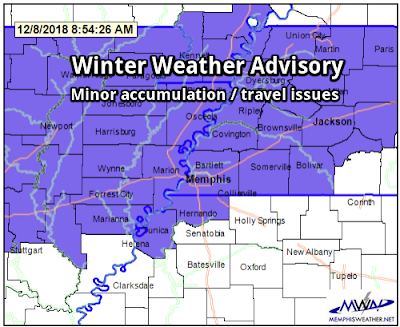 The most recent was in 2012, a year where Memphis just barely missed an all-out blizzard that hit parts of Arkansas on Christmas Night, with around an inch of snow falling the morning after Christmas in Memphis. In fact, during the four-year span from 2009-2012, snow flurries fell three times on Christmas Day! 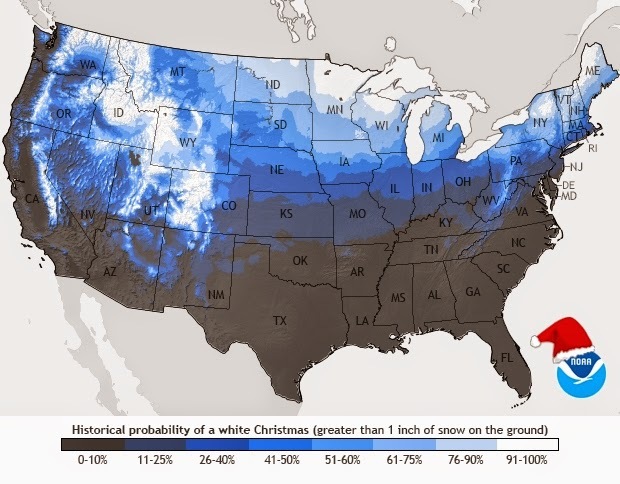 Officially, the National Climatic Data Center considers any city to have a “White Christmas” if at least one inch of snowfall is on the ground on Christmas morning, no matter when that snowfall occurred. Using this definition, Memphis does have a few additional years it can add to that list. Those include 1962, 1963, 1998, and 2004, in addition to the 1913 snowfall that occurred on Christmas Day. 2004 is likely the most remembered as the city had around 2” of a sleet and snow mixture covering the ground following a winter storm on December 22. Long-timers of the Memphis area may even better remember the historic Memphis snow of December 22, 1963. 10” of that 14.3” snowfall total still lay on the ground that Christmas morning! Official "White Christmases" in Memphis, which had at least 1" of snow on the ground. 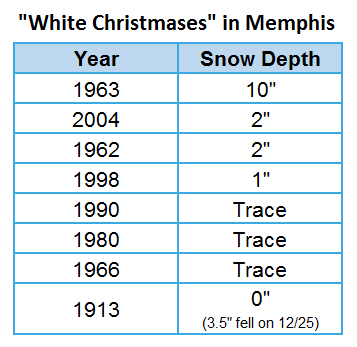 When considering the NCDC criteria, the odds of a White Christmas in Memphis - with at least 1" of snowfall on the ground - end up at around 3.6%. Slightly better than the 0.7% odds if you only consider measurable snowfall on Christmas Day itself! 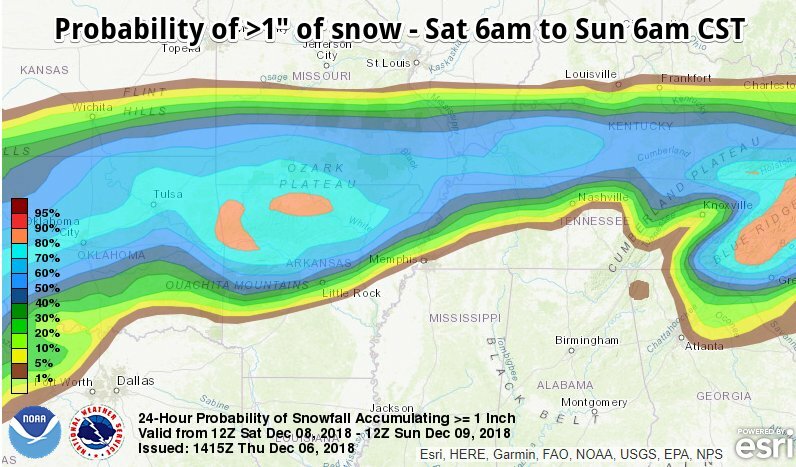 Either way, clearly the odds don't fall on your side if you're looking for a White Christmas and want to spend the holiday in Memphis. Perhaps one Christmas soon we'll be able to make a new exception to the rule! Until then, average expectations for any given year would indicate a cool, but not cold, Christmas Day and at best modest chances of precipitation, which almost always falls in liquid form. 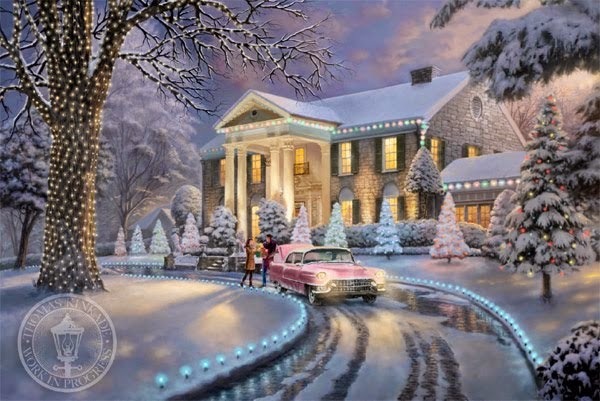 Top Image is "Graceland Christmas" by Thomas Kinkade, borrowed from artofthesouth.com. The weather looks to cooperate for all your weekend Holiday parties and festivities! A cold front will pass through overnight tonight (Thursday night – Friday morning). Friday morning some drizzle will still be possible, but as the front moves out, the moisture will move out as well, allowing skies to gradually clear by late in the day. Drier, colder air will be moving in Friday after the frontal passage, keeping temperatures in the lower 40s and dropping to near freezing at night. All in favor of Friday’s forecast being our Christmas forecast? I wish! Decent weather is expected Saturday and Sunday with high temperatures in the mid 50s and lows in the mid 40s. There is a chance of some showers late Saturday night into Sunday morning as another cold front pushes through Sunday. 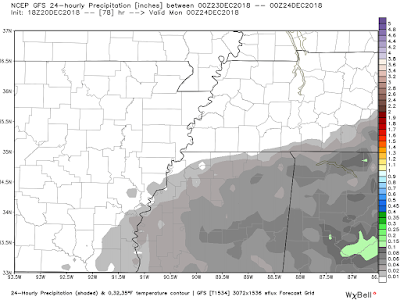 The GFS model (shown below) for 6pm Saturday through 6pm Sunday has only 0.02 inches of rain falling and most of it remaining in north MS. Other models have rain occurring further west and north, but the most significant precipitation occurring east of I-40. Christmas Eve looks to be just an average December day! The high temperature is forecast to be slightly above average (mid 50s) and the low right near average (mid 30s). Some sun is likely to peek out on Christmas Eve, but at least we’ll be waking up to 30 degree temperatures on Christmas morning! Christmas Day is when the forecasting challenge arrives. One reliable model is hinting at scattered showers throughout the day as moisture returns to the area. Changes to this forecast are likely with 5 days still to go before the holiday, but prepare for the possibility. The big Christmas Day question: Will it be cold enough to “feel” like Christmas? The average is high for Christmas Day in Memphis is 48 and the average low is 33. The forecasted high is in the mid 50s, which puts us above average, but not necessarily warm. It’ll be cool enough to keep on that tacky Christmas sweater and still be comfortable! The charts below show Christmas Day climatology for the Memphis area. The warmest December 25th on record occurred in 1889 with a high of 76°. The coldest December 25th on record occurred in 1983 when the temperature reached 0° and didn’t climb above 16°. Anyone remember this Christmas Day? The warmest Christmas Days in Memphis recorded history. The coldest Christmases in Memphis history. Be sure to follow us throughout the upcoming weekend as we fine-tune the forecast for Christmas Day! Hopefully the rain chances disappear, though don't count on a White Christmas this year! You can find the latest forecast on our mobile app or website with links posted below. [ Editor's Note: Lauren has been a dedicated social media intern for MWN for 2 years and is about to depart #TeamMWN as she prepares for a busy last semester at Mississippi State and graduation in May. It was only fitting that she have the opportunity to write a blog "in her own words" before moving on, since she has completed her first real forecasting class. My deepest appreciation and thanks to Lauren for the amazing job she has done for me, and all of you, the past two years! We wish her the best this spring, and in the future, as she achieves her dream of becoming a meteorologist! The month of November was well below normal in the temperature department with persistent cool air for nearly the entire month. All but seven days were below average with two of those occurring on the last two days of November as a warm spell bridged the flipping of the calendar to December. The coldest temperatures occurred mid-month with a week-long string of temperatures more than 10 degrees below average. During that period, a record cold maximum temperature was observed with a high of only 30 degrees on the 14th. Seven days never reached 50 degrees. Precipitation also ended below average, about one-fourth of normal, despite having measurable rain on nearly half of the days of the month. There were many days with less than 0.10" and only 2 days with more than an inch. There was no severe weather in the metro in November, though thunderstorms rumbled through on the evening of the 5th as highs reached 70 degrees. The only severe weather warnings issued by the National Weather Service for the month were a few Tornado Warnings that evening south of the greater Memphis area, with storms knocking down some trees in southern Marshall County, MS.
Another interesting event was the first winter weather event of the 2018-2019 season on November 14, as a potent upper level low moved over the Mid-South. Snowfall was generally under an inch in the metro, but the 0.6" recorded at the airport ranked 6th for most snowfall on a November day in history and the most in November in nearly 30 years. Records set or tied: Record cool maximum - 30 degrees on the 14th. Record warm minimum - 64 degrees on the 30th. Comments: The average temperature for the month ranked in the top 10% coolest on record. Records set or tied: Record snowfall occurred on 14th (0.6"). Comments: Three days recorded more than 0.5" of rain, two of which were over 1". Comments: Data was unavailable for November 13. 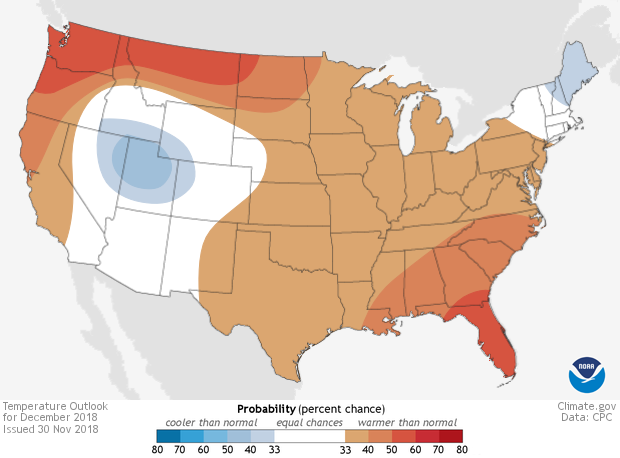 The December climate outlook for the United State from the Climate Prediction Center is shown below. Temperatures are forecast to be above normal for much of the nation except the Rocky Mountains and inter-mountain west. For Memphis, odds of above normal temperatures in December are 39%, near normal 33% and below normal 28%. Memphis typically averages just over 43.6° degrees for the month of December. A wet December is forecast for much of the United States except the northern tier of states. For Memphis, odds of above normal precipitation in December are 44%, near normal 33% and below normal 23%. December is historically the wettest month of the year in Memphis, averaging about 5.75" of precipitation. This month could be exceptionally so. Storms are currently rolling through the Mid-South, bringing a good splurge or rain. With the weekend now here, it brings the question: "How wet is the weekend supposed to be?" We will break down those rain chances, talk about how long we remain dry next week, and even take a peak at early projections for our Christmas forecast. With that low pressure system gradually moving through the Mid-South, we are receiving showers and storms. As of 5pm, a bulk of the storm activity is getting close to wrapping up. That said, rain will not be ending. Instead, showers will continue for tonight as they remain scattered. When not light rain, drizzle/foggy conditions will be taking place. With the rain and clouds, don't look for much day-vs-night temperature changes taking place: low of 46. National Weather Service's surface analysis map, showing the low pressure system bringing rain for the Mid-South. Your Saturday will start with lingering rain as we wait for the low to propagate out of our area. The morning brings the greatest chance for rain, with shower activity becoming lighter and more isolated by the afternoon. Minimal diurnal shifts remain a part of the forecast, so our high will only be 50 degrees. Saturday night cooler air creeps in as we just start to lose the clouds. By this point, that low is now out of the area and high pressure starts to build in, bringing an end to our rain chances. Weather Prediction Center's QPF Totals showing that we aren't expecting much rain over the next 5 days. Sunday through Wednesday, high pressure takes over, drying us out over this period of the forecast. With the dry weather comes the return of sunshine and clear nights: that means that we will see our diurnal temperature swings return. One thing of note is that today's low is going to be bringing in more Pacific like air, rather than Arctic, so we won't be pulling in colder air. Instead, look for our highs to range between the mid to upper 50s. Meanwhile, that diurnal swing effect means that we have our nighttime lows getting into the upper 30s. Wednesday night brings the return of clouds and rain chances. A shortwave will drop from the north, meaning that we will have conditions, though minimal, for getting some shower activity going. With the rain comes cloud cover which should help insulate us and keeping our temps a little warmer overnight, with a low near the mid 40s. A shortwave Wednesday night into Thursday in the Mid-South brings minimal rain chances that night and through the day. Rain chances from Wednesday night last into Thursday, though rain chances never climb too high. The weak shortwave mean that at most we will see scattered rain chances through the day as we remain mostly cloudy. Highs remain in the mid 50s. By that evening, we dry out somewhat as the clouds try to hang on. Lows in the lower 40s. 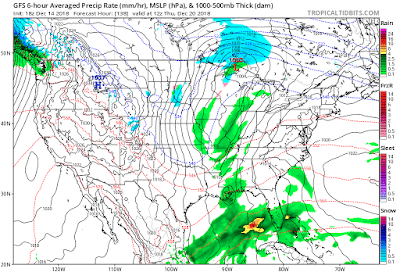 Friday takes on an interesting look for the forecast with a low pressure system setting up behind the shortwave. Depending on how fast and how far the low digs will determine how much moisture is pumped out of this system late Friday and into Saturday. Likewise, we need to watch how fast the cold air on the back side of the low infiltrates. For now, we are sticking with our normal forecast and saying mostly sunny skies for your Friday and temps climbing to the mid 50s. We will keep watching Friday night into Saturday as more model runs/data come available. With Christmas less than two weeks away (queues holiday panic), we are close enough to get some rough idea what that time frame will look like. 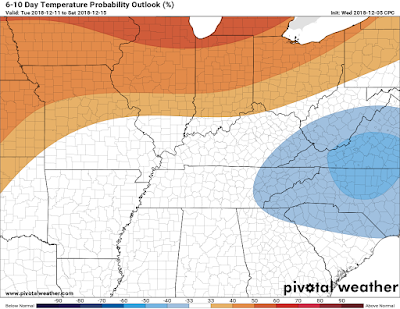 At the moment, as per the Weather Prediction Center, it looks to be a good chance we keep an above average weather pattern for that time frame. For those that don't like warm Christmases, we do have some good news so don't freak yet. Looks like we will be remaining near average precipitation wise, so no major wash outs for Christmas foretasted at the moment. In fact, ensemble forecasts look like they place us in a ridge during that time frame, which would mean we remain dry. All this said, there is still plenty of time for this forecast to change. Likewise, you know where to go to in order to find those changes! 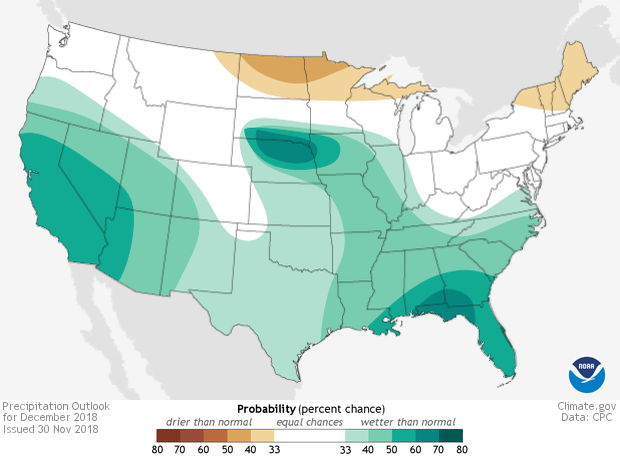 The WPC's temperature and precipitation outlooks are showing near average precipitation and above average temperature probabilities for the week of Christmas.